In my blog post about the new Menlyn and I mentioned that one of the new additions to the mall is Lush and I am quite happy with that. When I saw Lush I knew that I had to buy something and after missing out for so long I knew I had to purchase a bath bomb. The hardest part was choosing one. There are just so many to choose from. I felt like I died and went to heaven. I went for the Northern Lights bath bomb because first of all, the Northern Lights are amazing and the bath bomb has an fantastic scent. It is a lovely jasmine scent and just exploded along with the bath bomb. The experience was quite exciting. I don't think I have ever been so happy to take a bath. It was such a great show to watch the bath bomb release all the beautiful colours in the water. It was magic. A bath tub filled with so many beautiful colours is the best thing ever. I was in awe and I think it's time for me to get more products from Lush because my first purchase from Lush filled me with so much joy! 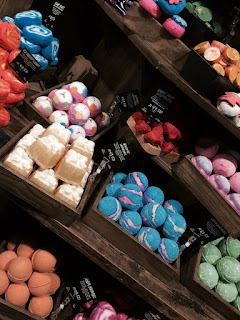 Which bath bomb is your favourite? I love this shop so Much!!! Their "Angels on Bare skin" face wash is the best! I should definitely check it out! The names already sound so exciting! My favourites are the Twilight bath bomb and Catastrophe Cosmetic fresh face mask! Yay to the Lush Life! Thanks for the suggestion, I'll check them OUT!